When I went to Gotland two months ago for the Babes in Boyland workshop, we visited the organic farm Lilla Bjers. On our tour around the farm, Margareta & Göran (the owners) proudly pointed out what looked like wild grown grass. Apparently, it was saffron! I had never seen a saffron field before (or well, this was more like a grassy patch than a field) so of course I was stoked. You might have seen my excitement on insta stories that day? I had no idea you could grow saffron in Sweden! But Gotland, our largest island here in Sweden, is special in that way. A lot of things that normally wouldn’t thrive this far north can actually grow there. The island is known for its thriving food culture, and when I was there in early May we ate both saffron cheesecake and obscene amounts of locally grown asparagus. 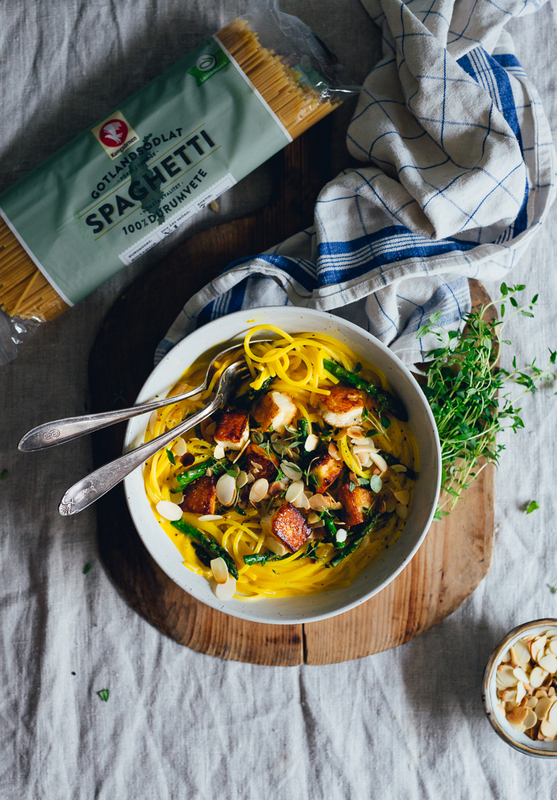 When Kungsörnen contacted me for this recipe collaboration, I learnt that they’ve managed to grow and harvest durum wheat on Gotland, and are now producing Gotland grown pasta in large-scale for the first time ever in Sweden! Otherwise our pasta is typically made from imported Italian durum wheat. Since I’m all for locally produced foods, I was eager to be a part of this campaign. The pasta I’ve used for this recipe is made from 100% Swedish grown durum wheat. 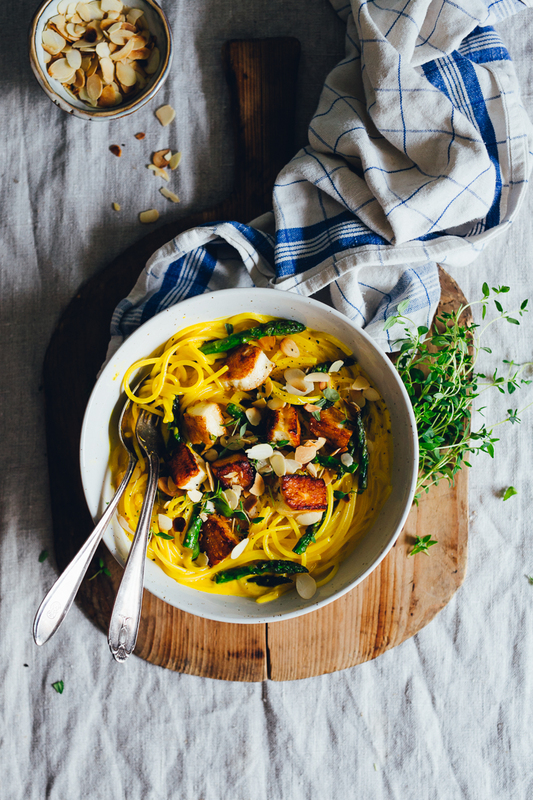 By sharing this recipe with you guys, I’m joining Kungsörnen’s competition ”Gotlandsstafetten” (”The Gotland Baton”) where a handful of foodie influencers compete on creating the best pasta recipe! And it’s you guys who decide the winner!! By liking my picture on instagram (either on my profile or Kungsörnen’s profile) you are also casting your vote my creamy saffron & lemon pasta. You can read more about the new Swedish durum wheat pasta and the competition here. My recipe is the last addition to the competition, which ends already next week! The other two contributors are my blog colleagues Gustav of Jävligt Gott and Catharina König aka Matfashionistan (who btw won Swedish Master Chef 2016 😳). I eat pasta all year around. For me it’s the ultimate comfort food, enjoyed in the sofa in front of a tv show during the winter, and in the garden with grilled vegetables and halloumi in the summer (or again in front of a tv show if it’s a rainy day 😜). Spaghetti and penne are my favorites. Which kind is your to-go? Whenever I make pasta, I go for the ”more is more”-method. Meaning that if you combine one favorite ingredient with another favorite ingredient, it can only get better, right? So I typically add everything that I crave at the moment, and then I swan dive into that bowl of goodness for a blissful 15 minutes (or 5 minutes if I’m really hungry). It’s the ultimate uplift food for those days when you just feel a little blue. For this recipe you gotta be a true lemon lover, cause there’s lots of it. Like, to the point where your tongue curls because it’s so sour. That’s how I like my lemon sauces! 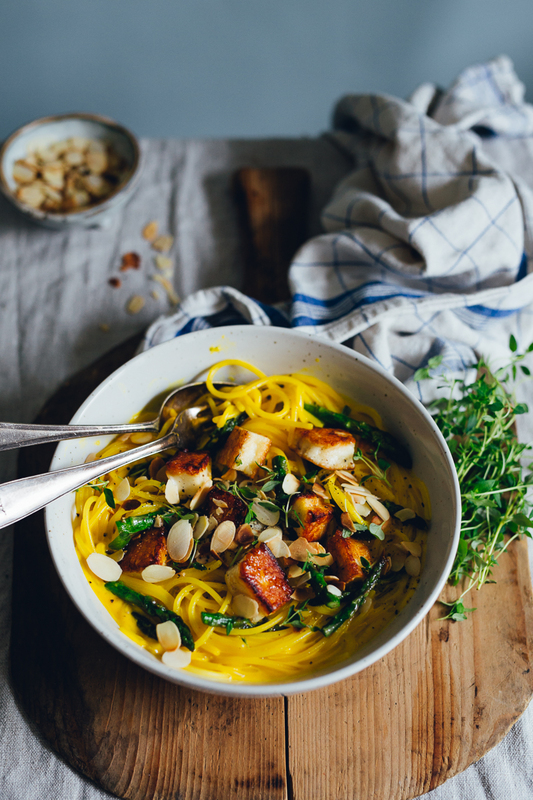 The tangy lemon pairs really nice with the warm and round qualities of saffron (which I btw wanna reclaim as an all year round spice because it’s seriously good with summery produce like asparagus, grilled zucchini or green peas). And both saffron & asparagus are typical Gotland ingredients – bonus points! I added halloumi because *summer* and slivered almonds for nuttiness and crunch. Garnish with fresh thyme and indulge. Curtain. 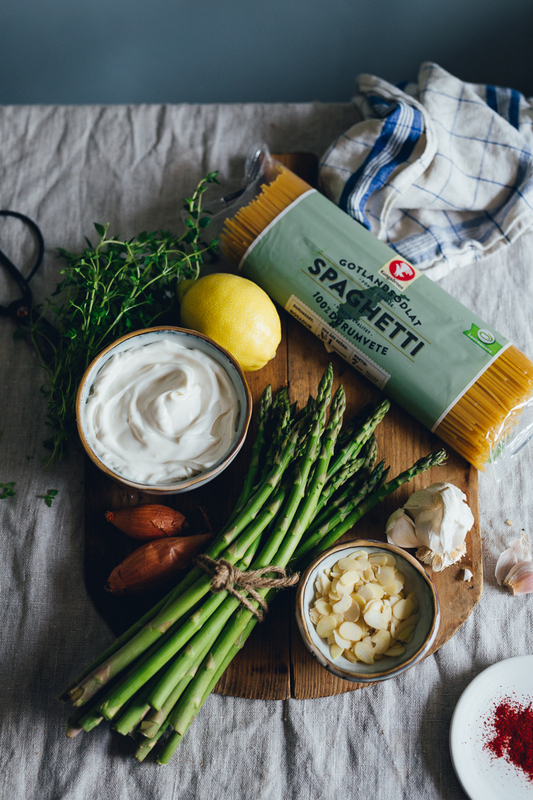 What’s your favorite pasta recipe? Prepare a large sauce pan with water for the pasta and bring to boiling. Meanwhile, finely chop shallot and garlic. Heat up the oil in a medium-sized sauce pan and gently fry shallot and garlic on medium low heat until translucent. Add the chili flakes and crumble the vegetable stock into the pan and fry for a another minute or so. Add oat sour cream, lemon juice, zest from 1/2 lemon, saffron, white balsamic vinegar and agave. Bring to a simmer while stirring. Season to taste with salt & pepper. Set aside. When the pasta water is boiling, add the spaghetti and a couple of generous pinches salt. Cook according to the instructions on the packet. Meanwhile, rinse and chop asparagus. Dice halloumi. Fry the asparagus in a little oil, salt & pepper until gently browned. Transfer to a plate. Then fry the halloumi chunks until golden. In a try skillet, gently toast the slivered almonds. 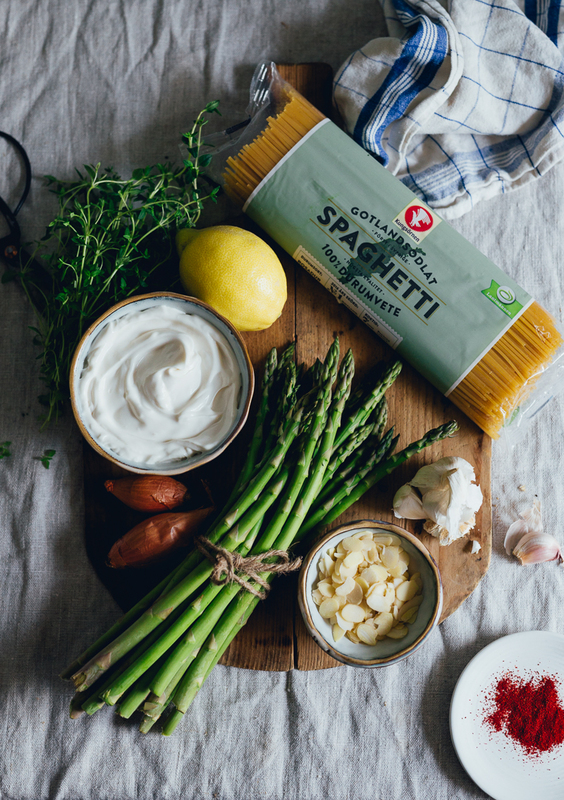 When the spaghetti is done, transfer to the sauce pan with saffron & lemon sauce along with the asparagus and give it a stir. Serve in bowls topped with halloumi chunks, slivered almonds, fresh thyme and a generous grind of black pepper. Like this post? Hit the heart button at the top or bottom of the post <3 That way I know which content you love and wanna see more of! This post was created in sponsored partnership with Kungsörnen. Sponsorships support my kitchen adventures and enable me to create blog posts for you guys full-time ♡All opinions are my own, as per usual. Most mouth watering images and recipe, since I am a vegetarian by heart, I so love your dish, thank you for sharing, Agnes. I’ve been intentional about preparing at least a few vegetarian dinners every week for my family, and pasta is a great favorite for all (kids are not so in love with salads ;) !). Over here we don’t have halloumi, do you think I can substitute feta? or mozzarella? Alltså du <333 Så otroligt gott det ser ut och alla bästa ingredienser till pasta ju. Måste testa när jag kommer hem! Men eller hur! Alla mina favoritingredienser också :-) Hoppas du gillar receptet!